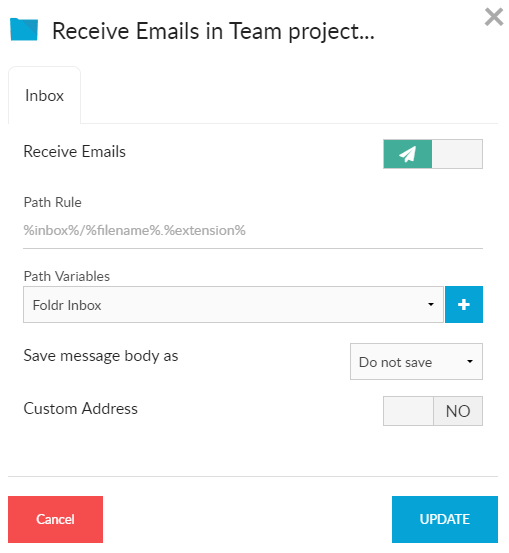 Inbox is a powerful feature that allows an organisation to use Foldr as an automated mechanism of receiving email attachments and placing them onto a chosen storage location. This can be any location available through Foldr such as an on-premise SMB share or cloud platform such as Google Drive or Dropbox. 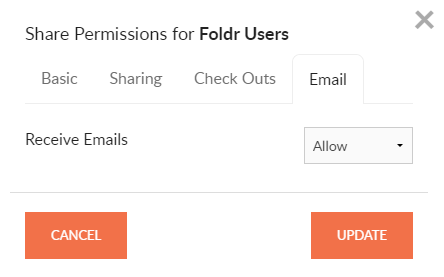 Users that have been granted permission can enable any shared folder to receive files through the Inbox feature. Each shared folder is given a randomly generated email address or the user can create a suitable custom address. When emails are received by the appliance, they are processed and the attachments are moved into the corresponding shared folder. An entry is then placed into the user’s Activity Feed and the body of the email is accessible using a link provided in the feed. The Foldr appliance receives inbound email on TCP port 25. However, only encrypted SMTP connections will be accepted and processed by the Inbox feature. Plain text SMTP connections will be discarded. The SMTP service running on the Foldr appliance upgrades the connection from plain text SMTP through the STARTTLS command. Should you need to enter multiple subnets, simply issue multiple separate commands as above. As with Share and Public Links, Inbox uses a separate permission entry available on each share configured on the Foldr appliance labelled Receive Email. As such you can enable this feature en-masse for all users by granting ‘Receive Email‘ permission to the built-in Foldr Users group, or select individual users or security groups as required. 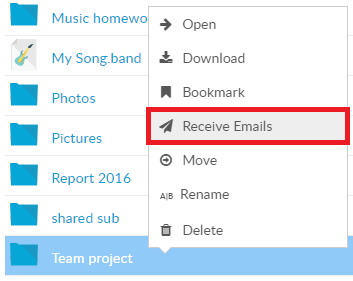 Users that have been granted the Receive Email and Share permission will now see the Inbox tab in the Sharing dialog in the web interface. Whilst you could direct email (the MX record) directly at Foldr, it is common practice that email is sent through an email security product / third party service, such as a hosted security provider that processes email before sending it onto the intended recipient server. The example below shows this and points the MX record for email sent to @demo.foldr.io at a Trend Micro cloud security product which has been configured to send mail onto the Foldr appliance. Please note that you cannot point an MX record at an IP address, it should always point to a host, which in turn has an A record pointing at the corresponding IP address. The ’10’ prefix in the example shown is a priority value, with zero being highest priority. More information on MX records and priorities can be found here https://en.wikipedia.org/wiki/MX_record. There may be other mechanisms in place inside the organisation to route email internally. The above is given as a basic example of creating a public MX record to allow mail to flow to the Foldr appliance. If Inbox is only to be used inside the organisation, it is not necessary to make any changes to the public domain DNS. The Foldr appliance does not provide any form of anti-spam, virus or malware scanning on mail that is received. You should ensure that mail flows through a third party provider or appropriate security product to perform this functionality before email is received by the Foldr server. On the folder that will be receiving the email attachments / message body using the context menu and select Receive Emails. This will present you with options for the path rule (where and how to save the attachments), built-in variables to assist building a path rule, whether the message body should be saved along with the attachments and finally if a custom address should be used. By default the message body of the email is not saved. However it is accessible to the end user if they click on the link in the Activity panel on the right of the web app. In order to save the message body alongside any files that may be attached to the email use the drop down menu as shown selecting the file format that the body should be saved in. You can change the Path Rule for the attachments that are received (i.e. how they are saved within the shared folder). By default, when the first email with attachments is received a directory will be created automatically in the root labelled Foldr Inbox and all attachments will be dropped directly into the root of this directory. This is represented by the default path rule below. You do not need to type over the placeholder text if this rule is suitable. Should another attachment be received with the same name, ‘copy’ will be appended to the attachment filename.